Since the Amundsen–Scott Station is located at the South Pole, it is at the only place on the land surface of the Earth where the sun is continuously up for six months and then continuously down for six months. (The only other such place is at the North Pole, on the sea ice in the middle of the Arctic Ocean.) Thus, during each year, this station experiences one extremely long "day" and one extremely long "night". During the six-month "day", the angle of elevation of the Sun above the horizon varies continuously. The sun rises on the September equinox, reaches its maximum angle above the horizon on the summer solstice in the Southern Hemisphere, around December 20, and sets on the March equinox. During the six-month "night", it gets extremely cold at the South Pole, with air temperatures sometimes dropping below −73 °C (−99 °F). This is also the time of the year when blizzards, sometimes with gale-force winds, strike the Amundsen–Scott Station. The continuous period of darkness and dry atmosphere make the station an excellent place from which to make astronomical observations. The number of scientific researchers and members of the support staff housed at the Amundsen–Scott Station has always varied seasonally, with a peak population of about 200 in the summer operational season from October to February. In recent years the winter-time population has been around 50 people. The original Amundsen–Scott Scientific Station was constructed during November 1956 to carry out part of the International Geophysical Year (IGY) of scientific observations during 1957 through 1958, and the station has been continuously occupied since then. As of 2005[update], this station lies within 100 meters (330 feet) of the Geographic South Pole. Because this station is located on a moving glacier, this station is, as of 2005, being carried towards the South Pole at a rate of about 10 meters (or yards) per year. [needs update] Although the United States Government has continuously maintained an installation at the South Pole since 1957, the central berthing, galley, and communications units have been constructed and relocated several times. Each of the installations containing these central units has been named the Amundsen–Scott South Pole Station. Snow accumulation is about 60–80 millimeters (water equivalent) per year (3 in/yr). The station stands at an elevation of 2,835 meters (9,301 feet) on the interior of Antarctica's nearly featureless ice sheet, which is about 2,700 meters (8,900 feet) thick at that location. The recorded temperature has varied between −12.3 °C (9.9 °F) and −82.8 °C (−117.0 °F), with an annual mean of −49 °C (−56 °F); monthly mean temperatures vary from −28 °C (−18 °F) in December to −60 °C (−76 °F) in July. The average wind speed is 5.5 m/s (12 mph); the peak gust recorded was 25 m/s (55 mph). The original South Pole station, now referred to as "Old Pole", was constructed by an 18-man United States Navy crew during 1956–1957. The crew landed on site in October 1956 and was the first group to winter-over at the South Pole, during 1957. Since the winter conditions at the South Pole had never been measured, the station was built partially underground in order to protect it from the worst imaginable weather. The low temperature recorded during 1957 was −74 °C (−101 °F). These temperatures, combined with low humidity and low air pressure, are survivable only with specialized equipment. On January 3, 1958, Sir Edmund Hillary's New Zealand part of the Commonwealth Trans-Antarctic Expedition reached the station over land from Scott Base, followed shortly by Sir Vivian Fuchs' British scientific component. As with all structures at the South Pole, the original station caused wind-blown snow to build up in the surrounding area. This snow accumulation resulted in the structure being further buried by about 1.2 meter of snow per year. The station was relocated and rebuilt in 1975 as a geodesic dome 50 meters (160 feet) wide and 16 meters (52 feet) high, with 14 m × 24 m (46 ft × 79 ft) steel archways, modular buildings, fuel bladders, and equipment. Detached buildings within the dome housed instruments for monitoring the upper and lower atmosphere and for numerous and complex projects in astronomy and astrophysics. The station also included the Skylab, a box-shaped tower slightly taller than the dome. Skylab was connected to the Dome by a tunnel. The Skylab housed atmospheric sensor equipment and later a music room. During the 1970–1974 summers, the dome construction workers were housed in Korean War tents, or "jamesways". These tents consist of a wooden frame with a raised platform covered by canvas. A double-doored exit is at each end. Although the tents are heated, the heat output is not sufficient to keep them at room temperature during the winter. After several jamesways burned down during the 1976–1977 summer, the construction camp was abandoned and later removed. However, starting in the 1981–1982 summer, extra seasonal personnel have been housed in a group of jamesways known as "summer camp". Initially consisting of only two jamesways, summer camp at its peak consisted of 11 berthing tents housing about 10 people each, two recreational tents and bathroom and gym facilities. In addition, a number of science and berthing structures, such as the hypertats and elevated dorm, were added in the 1990s, particularly for astronomy and astrophysics. During the period in which the dome served as the main station, many changes to US South Pole operation took place. From the 1990s on, astrophysical research conducted at the South Pole took advantage of its favorable atmospheric conditions and began to produce important scientific results. Such experiments include the Python, Viper, and DASI telescopes, as well as the 10 m (390 in) South Pole Telescope. The DASI telescope has since been decommissioned and its mount used for the Keck Array. The AMANDA / IceCube experiment makes use of the two-mile (3 km)-thick ice sheet to detect neutrinos which have passed through the earth. An observatory building, the Martin A. Pomerantz Observatory (MAPO), was dedicated in 1995. The importance of these projects changed the priorities in station operation, increasing the status of scientific cargo and personnel. The 1998–99 summer season was the last year that the US Navy operated the five to six LC-130 Hercules service fleet. Beginning in 1999–2000, the New York Air National Guard 109th Airlift Wing took responsibility for the daily cargo and passenger flights between McMurdo Station and the South Pole during the summer. In 1992, the design of a new station began for a 7,400 m2 (80,000 sq ft), two-story building that cost $150 million. Construction began in 1999, adjacent to the Dome. The facility was officially dedicated on January 12, 2008 with a ceremony that included the de-commissioning of the old Dome station. The ceremony was attended by a number of dignitaries flown in specifically for the day, including National Science Foundation Director Arden Bement, scientist Susan Solomon and other government officials. Because snow gradually settles over time under its own weight, the foundations of the building were designed to accommodate substantial differential settling over any one wing in any one line or any one column. If differential settling continues, the supported structure will need to be jacked up and re-leveled. The facility was designed with the primary support columns outboard of the exterior walls so that the entire building can be jacked up a full story. During this process, a new section of column will be added over the existing columns then the jacks pull the building up to the higher elevation. South Pole Telescope (2007–present), used to survey the CMB to look for distant galaxy clusters. Python Telescope (1992–97), used to observe temperature anisotropies in the CMB. AMANDA (1997-2009) was an experiment to detect neutrinos. The BICEP1 (2006–08) and then BICEP2 (2010-2012) instrument was also used to observe polarization anisotropies in the CMB. BICEP3 is now under development and due to deploy in 2015. The QUaD (2004–09),used the DASI mount, used to make detailed observations of CMB polarizaton. During the summer the station population is typically around 150. Most personnel leave by the middle of February, leaving a few dozen (45 in 2015) "winter-overs", mostly support staff plus a few scientists, who keep the station functional through the months of Antarctic night. The winter personnel are isolated between mid-February and late October. Wintering-over presents notorious dangers and stresses, as the station population is almost totally isolated. The station is completely self-sufficient during the winter, and powered by three generators running on JP-8 jet fuel. An annual tradition is a back to back viewing of The Thing from Another World (1951), The Thing (1982), and The Thing (2011) after the last flight has left for the winter. The station has a runway for aircraft (ICAO: NZSP), 3,658 m (12,001 ft) long. Between October and February, there are several flights per day of ski-equipped LC-130 Hercules aircraft from McMurdo to supply the station. Resupply missions are collectively termed Operation Deep Freeze. Data access to the station is provided by access via NASA's TDRS-4, 5, and 6, GOES-3 & Iridium satellite constellation. For the 2007–08 season, the TDRS relay (named South Pole TDRSS Relay or SPTR) was upgraded to support a data return rate of 50 Mbit/s, which comprises over 90% of the data return capability. The TDRS-1 satellite formerly provided services to the station, but it failed in October 2009 and was subsequently decommissioned. Marisat and LES 9 were also formerly used. The peak season of summer lasts October to February. On January 10, 1995, NASA, PBS, and NSF collaborated for the first live TV broadcast from the South Pole, titled Spaceship South Pole. During this interactive broadcast, students from several schools in the United States asked the scientists at the station questions about their work and conditions at the pole. In 1999, the winter-over physician, Dr. Jerri Nielsen, found that she had breast cancer. She had to rely on self-administered chemotherapy using supplies from a daring July cargo drop, then was picked up in an equally dangerous mid-October landing. On May 11, 2000, astrophysicist Dr. Rodney Marks became ill while walking between the remote observatory and the base. He became increasingly sick over 36 hours, three times returning increasingly distressed to the station's doctor. Advice was sought by satellite, but Dr Marks died on May 12, 2000 with his condition undiagnosed. The National Science Foundation issued a statement that Rodney Marks had "apparently died of natural causes, but the specific cause of death ha[d] yet to be determined". The exact cause of Marks' death could not be determined until his body was removed from Amundsen–Scott Station and flown off Antarctica for an autopsy. Marks' death was due to methanol poisoning, and the case received media attention as the "first South Pole murder", although there is no evidence that Marks died as the result of the act of another person. In January 2007, the station was visited by a group of high-level Russian officials, including FSB chiefs Nikolay Patrushev and Vladimir Pronichev. The expedition, led by polar explorer Artur Chilingarov, started from Chile on two Mi-8 helicopters and landed at the South Pole. On September 6, 2007, The National Geographic Channel's TV show Man Made aired an episode on the construction of their new facility. On the November 9, 2007 edition of NBC's Today, Today show co-anchor Ann Curry made a satellite telephone call which was broadcast live from the South Pole. During the 2011 winter-over season, station manager Renee-Nicole Douceur experienced a stroke on August 27, resulting in loss of vision and cognitive function. Because the Amundsen–Scott base lacks diagnostic medical equipment such as an MRI or CT scan machine, station doctors were unable to fully evaluate the damage done by the stroke or the chance of recurrence. Physicians on site recommended a medevac flight as soon as possible for Douceur, but offsite doctors hired by Raytheon Polar Services (the company contracted to run the base) and the National Science Foundation disagreed with the severity of the situation. The National Science Foundation, which is the final authority on all flights and assumes all financial responsibility for the flights, denied the request for medevac saying the weather was still too hazardous. Plans were made to evacuate Douceur on the first flight available. Douceur and her niece, believing Douceur's condition to be grave and believing an earlier medevac flight possible, contacted Senator Jeanne Shaheen for assistance; as the NSF continued to state Douceur's condition did not qualify for a medevac attempt and conditions at the base would not permit an earlier flight, Douceur and her supporters brought the situation to media attention. In March 2014, BICEP2 announced that they had detected B-modes from gravitational waves generated in the early universe, supporting the inflation theory of cosmology. A South Pole station called Snowcap Base was the site of the first Cybermen invasion of earth in the 1966 Doctor Who serial The Tenth Planet. The 1938 science fiction story Who Goes There? was set at the South Pole and has been made into a film three times: by Howard Hawks in 1951 (dialogue indicates the setting in this version is near the North Pole), by John Carpenter in 1982, and by Matthijs van Heijningen Jr. in 2011. In the fourth season episode of House M.D. entitled "Frozen", Gregory House is tasked to help a female patient by videoconference who was located at 'an Antarctic outpost'; this was likely modeled on the Jerri Nielsen incident mentioned above. The BBC program On Thin Ice covered the participation of two-time British Olympic gold medalist James Cracknell, television host Ben Fogle and Dr. Ed Coates in the first organised race to the South Pole since Amundsen beat Scott. The final episode of the five part series showed the three arriving at the South Pole, with the Amundsen–Scott Station in the background. The three finished second, twenty hours behind a two-man team from Norway. The station is featured prominently in the The X-Files movie Fight the Future. The South Pole sees the sun rise and set only once a year. Due to atmospheric refraction, these do not occur exactly on the September equinox and the March equinox, respectively: the sun is above the horizon for four days longer at each equinox. The place has no solar time; there is no daily maximum or minimum solar height above the horizon. The station uses New Zealand time (UTC+12, UTC+13 during daylight saving time) since all flights to McMurdo station depart from Christchurch and therefore all official travel from the pole goes through New Zealand. ↑ Modern Marvels episode, "Sub-Zero Tech". ↑ Harvard-Smithsonian Center for Astrophysics. "In Memoriam". The CfA Almanac Vol. XIII No. 2, July 2000. Retrieved on December 19, 2006. 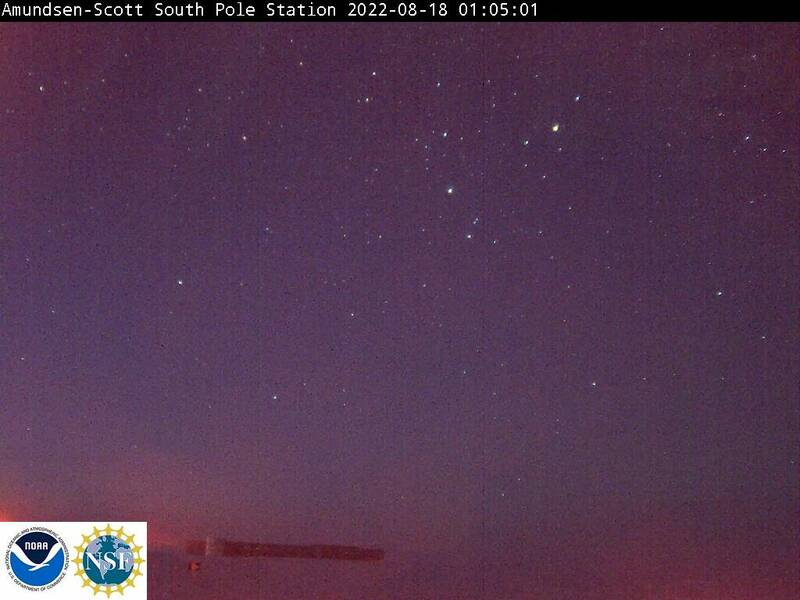 ↑ Amundsen–Scott South Pole Station. Memorial. Retrieved on December 19, 2006. ↑ "Antarctic Researcher Dies". National Science Foundation Office of Legislative and Public Affairs, Press release May 12, 2000. Retrieved December 19, 2006. ↑ "Australian scientist dies during Pole winter". The Antarctic Sun October 22, 2000. Retrieved on December 19, 2006.
weak nuclear force, another personal record South pole winter-over page. This page was last modified on 7 January 2016, at 18:05.